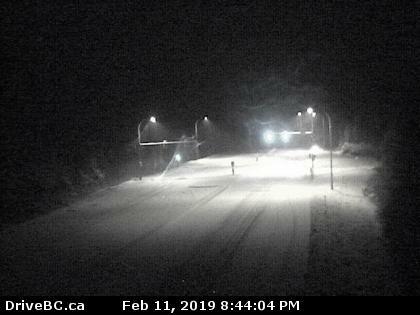 Highway 19 at Black Creek is pictured at 8:44 pm on February 11th, 2019. Image sourced from DriveBC. VANCOUVER ISLAND, B.C- Travellers along local highways are being cautious tonight. Due to the heavy snow throughout eastern Vancouver Island, Highway 19 and the Old Island Highway are moving slowly this evening. Drivers should watch for slippery sections of slush or compact snow between Buckley Bay to Campbell River. There had been one significant area of slowdown in the northbound lanes of Highway 19 just off the Buckley Bay interchange, but it now appears to be clearing. There have been no reports of significant accidents anywhere along the regional highways, or in the municipal areas of the Comox Valley and Campbell River.